Background: Existing laparoscopic instrument holders do not seem to sufficiently fulfil the needs of surgeons performing minimally invasive surgery (MIS) in several respects. 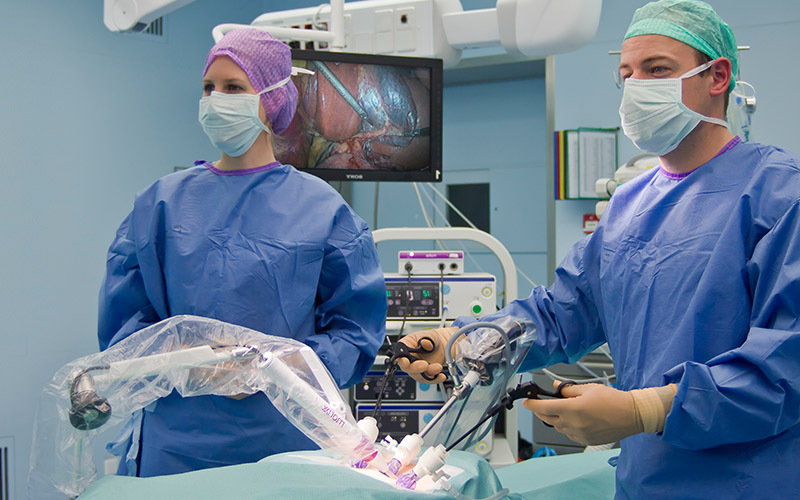 Therefore, we developed and tested a novel laparoscopic instrument positioner in close cooperation between surgeons and engineers. Material and methods: Design requirements were established by attending laparoscopic interventions, interviews and involving surgeons during the design cycle by evaluation of early mock-ups and prototypes. Results: Two concepts, based on a scissor- and a deflectable ball principle, were elaborated and evaluated yielding a simple, affordable system, fixating all degrees of freedom in the centre of motion. A sterile functional prototype was fabricated and successfully tested during three clinical interventions. Users reported a stable image, easy and intuitive handling and no interference with other surgical instrumentation. The posture was conceived to be more ergonomic and surgeons liked the ability to control the positioning of the endoscope directly themselves. Conclusions: Three successful interventions show that involving surgeons in the design and testing phase of product development leads to a novel instrument positioner that can be used safely in a clinical setting. It can be concluded that the system is simple and intuitive to use, as there was no learning curve.